Flying High to Improve Vegetation Management - McCord Engineering, Inc.
As seen in Transmission & Distribution World Magazine, March 2017. A few years ago, following a major drought that swept across the state of Texas, dead trees resulted in thousands of power outages in Mid-South Synergy Electric Cooperative’s service area. The coop responded by using geographic information system (GIS) mod­eling (see T&D World, March 2013) using freely available GIS data on soils, vegetation and rainfall. Historic outages were also part of the data set used in the analysis. The coop man­aged to create maps showing areas with the highest risk of dead trees. These maps became the source of work packets dis­patched to right-of-way (ROW) crews for hazard tree control. This was in addition to the coop’s ongoing cyclical trimming exercise, which was done concurrently. Using this two-pronged approach of GIS and previously established cycles, the coop cut down more than 60,000 dead trees close to distribution lines over a three-year period, result­ing in a significant decrease in vegetation-related outages to the coop’s pre-2012 levels. This also resulted in a significant drop in the number of dead-tree-related customer calls, as the trees were being cut down before the customers had time to call in and alert the coop. Although the GIS-derived results went a long way to im­proving the hazard tree control effort at Mid-South Synergy, the coop thought there was still room for improvement. In as much as the coop’s GIS model gives general pos­sible locations of dead trees, the method is not foolproof. The model lacks the ability to pinpoint the actual location of a dead tree or hazard tree. If known, this ability would go a long way to reducing the number of truck rolls, because crews would be dis­patched only to specific areas where hazard trees are present. 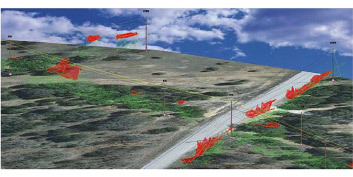 The model also does not have the ability to de­termine the distance between hazard trees and distribution lines, or to help to determine vegetation height. Trees growing outside the right-of-way that could contact the distribution lines if they fell, causing an outage and result­ing in mechanical damage or triggering a fire. Trees within and outside of the right-of-way that are dead and need to be cleared as soon as possible. Trees that are overhangs and could fall on power lines. These four missing pieces of the puzzle could help to take the guesswork out of any vegetation assessment, which the cooperative thought was currently subjective, inconsistent, costly and inefficient. An unmanned aerial vehicle (UAV ) or drone flying at a low altitude of 200 ft (61 m) can capture high-resolution im­ages of overhead distribution lines if mounted with the right camera. If equipped with light detection and ranging (LiDAR), vegetation height antd the distance of vegetation from the dis­tribution conductors under all operating temperatures and conditions can be determined from the acquired point cloud data. Attaching a multispectral camera to the drone allows for capturing data in the visible as well as near-infrared and in­frared bands of the electromagnetic spectrum. This data can be used to determine vegetation health using the Normalized Difference Vegetation Index (NDVI). NDVI is a standardized index that takes advantage of the contrasting characteristics of two bands from a multispectral raster data set: the chlorophyll pigment absorptions in the red band and the high reflectivity of plant materials in the near-infrared band. The in­dex outputs an image showing greenness or relative biomass. NDVI values range from -1.0 to 1.0 with negative NDVI values being generated from clouds, water and snow; values near zero are mainly generated from rock and bare soil. Very low NDVI values (<0.1) correspond to barren areas of rock, sand or snow; moderate values (0.2 to 0.3) represent shrub and grass­land; and high values (0.6 to 0.8) indicate tem­perate and tropical rainforests. 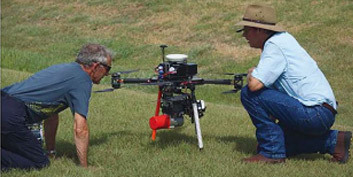 In collaboration with McCord Engineering, an engineer­ing consultancy firm that handles the design for all of the cooperative’s work plan jobs, Mid-South Synergy embarked on a pilot project to test the effectiveness of using a drone to cap­ture data for vegetation management (among other things). McCord Engineering had already been flying the drone to collect engineering line design specific data. The drone was mounted with a LiDAR sensor and multi­spectral camera to capture true-color aerial imagery, LiDAR (-500 points m-2) and NDVI (green, red, red edge and near­infrared bands) on the same flight. The data was then post-processed for location correction using known and established ground control points or land­marks. Mosaics were created from the true-color and NDVI imagery, and further visualization and image analysis was done in Esri ArcGIS 10.5 software. PLS-CADD locates vegetation that has encroached on the utility’s ROW as derived from LiDAR point cloud data. Armed with this information, crews are dispatched to dear vegetation at specific areas. Because of the massive number of viola­tions in the LiDAR point cloud, PLSi recently added a feature to PLS-CADD to group all of them intelligently into a single work site for each violation region. This is actionable information the coop has just started to use. Crews now know the exact work sites where they need to cut down trees or trim vegeta­tion within the utility’s ROW. This work site data can be exported for use in the GIS along with relevant information about each work site such as geographical location, vegetation height and area of vegetation. Color infrared images display an object’s reflectivity or, conversely, its absorption of infrared light, making them an incredibly valuable tool to show the health and density of vegetation. 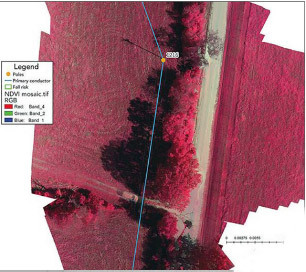 In some cases, analysis indi­cates there is vegetation right around the coop’s primary conductor. Without LiDAR data exposing the height of the vegetation, it may be easy to assume the vegetation is in the utility ROW or is hazardous, which it really is not. In NDVI images, the lighter colors represent healthy vegetation, while the dark colors represent stressed or dead vegetation. Analysis can show an overlay of NDVI and tree fall risk indicated as colored polygons. Even healthy trees outside the coop’s ROW can pose a risk to lines in the event they fall. 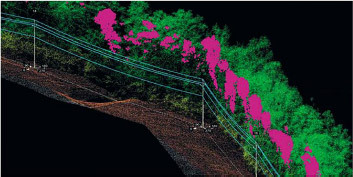 LiDAR point cloud data enables the computa­tion of the distance and height values needed to determine clearance violations as well as whether vegetation will fall on conductors or not. With high­resolution 2-D imagery that does not have height in­formation, it is not possible to differentiate between vegetation that poses a risk to the conductors from non-risky vegetation. Once NDVI data was added to LiDAR, the cooperative managed to know the vegeta­tion condition and, hence, was in a position to make a more educated call on whether a tree had the po­tential to fall onto the conductors. While visually inspecting true-color images for dead trees can be done, it is highly subjective and can be reasonably done only for a small study area. NDVI data simplifies the process, enabling larger areas to be studied and consistent results to be yielded. The pilot project was successful in yielding data that helped Mid-South Synergy to identify clearance violations and hazard trees close to the conductors. The cooperative has already started to use data from the pilot project to dispatch crews to areas where haz­ard trees need to be cut down and trimming needs to be done to maintain a clear utility right-of-way. Without the data from the UAV, the coop would still be sending out crews to general locations where there may or may not be hazard trees, hence the possibility of unnecessary truck rolls. 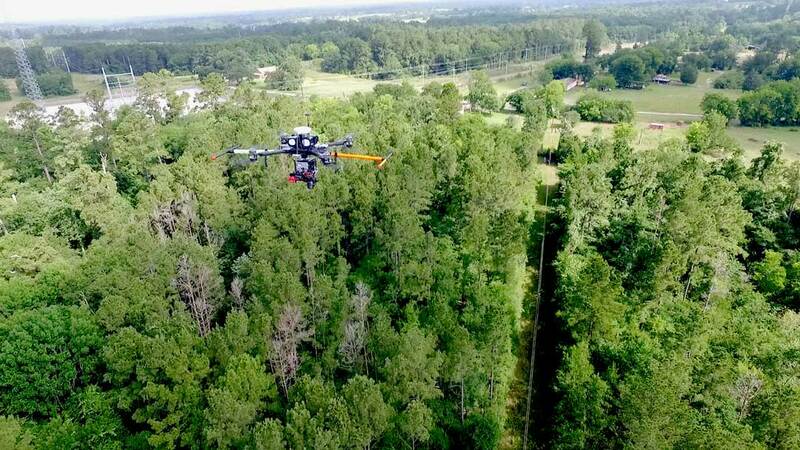 Because McCord Engineering is flying the UAV to collect Li DAR data to carry out engineering modeling for Mid-South Synergy’s work plan jobs, the annual cost of the cooperative’s work plan decreased by 5%. This is because data is being col­lected faster and there are fewer hours in the field. Mid-South Synergy will maintain its clearance cycles but will also include LiDAR and NDVI on each of the feeders that are part of the annual work plan projects being done by its engineering consultant. This will help the cooperative to ad­dress hazard trees as soon as possible while maintaining its trimming cycles. 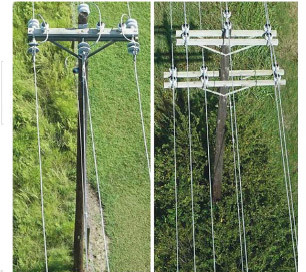 Future overhead line inspection will be augmented by high­ resolution images that enable asset inspection to be done with­out going to the field. There is an opportunity for the coop to reduce its overhead inspection cost by using data derived from the drone flights. Geotagged asset photos are easily incorpo­rated into the coop’s GIS. Also, GIS data such as utility poles and conductors can be mapped accurately and incorporated seamlessly into the cooperative’s GIS. It is also expected, once the line-of-sight requirement for UAV operation is lifted, that the coop can benefit from drone flights for damage assessment In this case, the drone can fly in inaccessible areas or areas that may be dangerous for crews to go, especially after a storm. The authors would like to acknowledge the help and col­laboration of Otto Lynch of PLSi. Comfort Manyame (cmanyame@midsouthsynergy.com) is the senior manager for research and technical strategy at Mid-South Synergy Electric Cooperative. His work, which includes GIS, utility vegetation management and lightning strike analysis, has been widely published, including in Esri’s “GIS Best Practices for Municipalities, Cooperatives, & Rural Electric Utilities” and RE Magazine. He serves on the National Rural Electric Coopera­tive Association’s Analytics, Resilience and Reliability Member Advisory Group. Manyame holds a Ph.D. from Texas A&M University in College Station, Texas. Tom Jackson (tjackson@mccordeng.com) is manager of the PLS-CADD and aerial services division at McCord Engineering Inc., College Station, Texas, where he began in 1999 as a field services technician. Jackson understands the data collection needed for engineering and the importance of keeping tech­nology current. He is heavily involved in research and develop­ment, and he works closely with Dr. Manyame and PLS-CADD to integrate and use new technology.